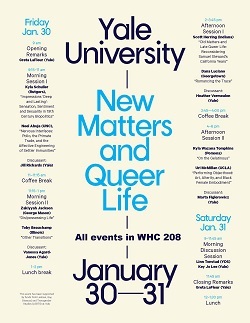 All events in WHC 208. Over the past decade, work in queer theory and feminist studies has consistently explored the potential and challenges of accounting for the stickiness, or “animacy” as Mel Chen has termed it, of putatively non-living entities. Recent work by Chen, as well as Rosi Braidotti, Jane Bennett, and Bruno Latour, has had the effect of both stimulating a wide degree of interest in the life of matter, as well as propelling us toward a retrospective reevaluation and reincorporation of scholarship once thought less central to the development of queer theory. At the same time, work in philosophy, feminist science studies, literary studies, performance studies, anthropology, and a number of other fields has questioned the category of “life,” reorganizing the categories of living/nonliving, human/nonhuman, and so on, and ultimately demanding a reconsideration of the notion of vitality itself. The incredible scope of these new approaches includes the development of methodologies such as the new materialism, surface hermeneutics, object-oriented ontology, and a return to the biological in feminist studies, among others, and many scholars see great potential in this new set of approaches. But even as we turn our attentions to the material, the biological, or the embodied in order to emphasize or push forward the political stakes of our scholarship, we must also confront imminent critiques of new materialism that reject this approach on the grounds that the scale or scope inherent in, for example, reading surfaces or theorizing at the level of the molecular or atomic necessarily decontextualize and depoliticize both the objects of our analysis and the scene of analysis itself. Indeed, even as queer studies has both embraced and challenged understandings of materiality—exploring the possibilities of the vital and morbid, the animate and inanimate, the human and inhuman, the sensory and torpid, the surface and visceral, the material and the environmental—we have found ourselves left with commensurate questions that interrogate the politics of this arrival to and embrace of the object. We intend for “New Matters and Queer Life” to create space for a moment of pause, reflection, and evaluation regarding the ontological turn, at this moment in which it has both achieved a certain intellectual preeminence in the humanities, and is also being received with an increasing amount of suspicion. The object of this conference, as it were, is not simply to engage with the ontological turn, but to reflect more broadly on the timeliness of new materialisms in particular, and to consider their intellectual and political promise and limitations. Some questions that we might consider: in this emphasis on objects and materiality, do our understandings of the subject and subjectivity change in turn? What are the implications for what Sara Ahmed has called a queer phenomenology? Have we exhausted the possibilities or impossibilities of subjectivity? What are the limitations or oversights of this turn to the material? What kinds of temporal, racial, spatial and/or embodied knowledges are embedded within this hermeneutics? Does this turn to questions of embodiment, materiality, humanity or inhumanity constitute an attempt to respond to decades-long critiques of dominant modes of queer and sexuality studies research that have not sufficiently attended to the specificities of racialized or disabled experience (among others)? Or does the new materialism reify anew these silences, refusals, or abjections? This event is sponsored by funds from the LGS Endowment Fund and by Lesbian, Gay, Bisexual, and Transgender Studies (LGBTS) at Yale.